This Consumer Awareness resource is provided for schools and parents that offers effective online education providers and education delivery models, performance data, cost structures, and research trends. The purpose of this resource is to make consumers aware of the status of online learning in Michigan and is specifically designed to inform parents, school personnel, and school board members of the nature of online learning options, their effectiveness for Michigan students, the costs of these programs, and current trends. 2008 – Allowed school districts to seek a waiver of the state’s pupil accounting rules to allow eligible full-time students to take all of their coursework online through a process implemented by Michigan’s Superintendent of Public Instruction. Section 21f, the latest and furthest reaching online learning policy to date, expands access to digital learning options for students in Michigan by establishing that public school students in grades K-12, with the consent of parent or legal guardian, may enroll in up to two online courses during an academic term from the courses listed in their district’s local catalog or from Michigan’s Online Course Catalog. Michigan’s Online Course Catalog contains syllabi information as well as enrollment and course dates. All courses contained in the catalog include results of a quality assurance review that uses nationally-recognized standards and performance data based upon course completion. The information in these reviews will assist parents, students, and school personnel in making the best possible choices for students. If a student is denied enrollment in an online course, parents and/or the student may appeal the decision with the superintendent of the intermediate school district in which the student’s educating district is located. More information about Section 21f is available through the Michigan Virtual website, including access to Frequently Asked Questions and the 21F Tool Kit, which includes an implementation guide for school personnel, sample letters, forms, and draft policies for use by school districts. Currently, digital learning options in Michigan include Michigan Virtual, 14 cyber schools that draw students from across the entire state, and programs run by consortia and individual school districts that often make use of online courses from third-party providers. These options provide Michigan students with many paths for online learning. Some Michigan students take one or two courses from an online provider in order to supplement their brick and mortar school curriculum; this online learning option is known as a supplemental program. Some students are involved in a full-time program and take all of their courses online. Still, other students are part of the fastest growing option – blended learning – which means the teacher integrates online resources that transform the traditional classroom. While there may be a number of different options for K-12 online learning, one provider or model does not suit all students or districts. Determining the best option or combination of options requires understanding available online learning programs and the student’s academic needs. Section 21f, the latest and furthest reaching online learning policy to date, expands access to digital learning options for students in Michigan by establishing that public school students in grades K-12th, with the consent of parent or legal guardian, may enroll in up to two online courses during an academic term from the courses listed in their district’s local catalog or from Michigan’s Online Course Catalog. Michigan’s Online Course Catalog contains syllabi information as well as enrollment and course dates. All courses contained in the catalog include results of a quality assurance review that uses nationally recognized standards. The information in these reviews will assist parents, students, and school personnel in making the best possible choices for students. Online learning encompasses different educational models and programs which vary in many of their key elements. Keeping Pace, a nationally recognized leader in K-12 online and blended education research, published a set of 10 defining dimensions that characterize an online learning program’s structure and delivery, adapted from the work of Gregg Vanourek. (See Defining Dimensions of Online Programs figure below). The dimensions include whether the program is supplemental or full-time, the breadth of its geographic reach, the organizational type and operational control, and the location and type of instruction. Some of these attributes may be combined or operate along a continuum (e.g., location and type of instruction). No one type or combination of attributes is “best” or better than any other; each model simply presents its own opportunities and challenges for students and parents. Understanding the possible dimensions of online programs will help inform planning and decision making that leads to success for students. Comprehensiveness (supplemental vs. full time): One important distinction is whether the online learning program provides a complete set of courses for students enrolled full-time or provides a small number of supplemental courses to students enrolled in a physical school. Full-time online schools typically must address the same accountability measures as physical schools in their states. Reach: Online learning programs may operate within a school district, across multiple school districts, across a state, or, in a few cases, nationally or internationally. The geographic reach of online learning programs is a major contributing factor to the ways in which education policies can be outdated when applied to Internet-based delivery models. It may also provide opportunities for students to participate in online courses with educators and other students from different cultures. Delivery (synchronous vs. asynchronous): Most online learning programs are primarily asynchronous, meaning students and teachers work at different times, communicating via email and discussion boards. Type of Instruction (from fully online to fully face-to-face): Many programs are now combining the best aspects of online and classroom instruction to create a variety of blended learning experiences. These dimensions provided a language for thinking and talking about different online and blended models. While the focus of this report is not blended learning, a brief explanation may be helpful. According to the State School Aid Act, blended learning is a “hybrid instructional delivery model where pupils are provided content, instruction, and assessment, in part at a supervised educational facility away from home where the pupil and a teacher with a valid Michigan teaching certificate are in the same physical location and in part through internet-connected learning environments with some degree of pupil control over time, location, and pace of instruction.” The Christensen Institute, a national leader in blended learning research, developed a Blended-Learning Taxonomy as a categorization of existing blended learning models: rotation, flex, a la carte, and enriched-virtual. The structures for these models are created once decisions have been made in regard to each of the defining dimensions of a program. Similar to the online learning dimensions and models, the elements are not mutually exclusive, and many elements can, and do, exist simultaneously. Rotation model: A course or subject in which students rotate on a fixed schedule or at the teacher’s discretion between learning modalities, at least one of which is online learning. Flex model: Teachers serve mainly as facilitators, guiding students on an individually customized and fluid schedule within which content and instruction is delivered primarily online. The level of face-to-face support may vary. A La Carte model: Students elect to take one or more supplementary courses in a fully online format and complete coursework either on campus or off-site. Enriched-Virtual model: Students divide their time between receiving instruction at a traditional brick-and-mortar school building and through fully online coursework. This model is implemented school-wide. Online learning can be more demanding than learning in a traditional classroom. The fact that the teachers and curricular experts associated with an online course often are not known to the school or parent raises some concerns. These concerns can be addressed prior to committing to a course or program of learning. Before schools or parents select courses for their students, the providers of online content should be examined according to a set of criteria recognized as indicators of quality and effectiveness. iNACOL’s Parent’s Guide to Choosing the Right Online Program recommends looking at Accreditation and Transferability of Credit, NCAA Certification, Governance and Accountability, Curriculum, Instruction, Student Support, and Socialization. (See the guide for more detailed information on these categories). Some effectiveness indicators are described below. Accreditation is a process by which educational providers are certified by accreditation agencies. It serves as a way for schools to demonstrate that they’ve met high standards and are willing to allow outside agencies to evaluate them. It is also a valuable process for institutions like schools and districts to determine what courses are worthy of credit. When considering accreditation, the reputability of the accrediting agency is of importance. More information and a list of regional accrediting agencies is included in iNACOL’s Parent’s Guide to Choosing the Right Online Program. When choosing an online education provider, it is important to understand the governing agency behind the school (state virtual school, local school district, chartering agency, etc.) and the accountability measures to which the school is held. Refer to iNACOL’s Parent’s Guide for more information and a helpful checklist on this topic. Some students say they get more attention and support online because the environment often requires one-to-one interaction that may not happen in the classroom. To address concerns about the quality of instruction, verify the teacher is “highly qualified.” According to the No Child Left Behind Act (2001), to be considered “highly qualified,” teachers must hold a bachelor’s degree, full state certification or licensure, and be able to demonstrate that they know the content areas they teach. Teacher/student ratios detail the number of students per teacher in each classroom or course. Note that working with students one-on-one in a classroom setting is much different from working with students virtually. All K-12 online courses offered through Section 21f must be entered into Michigan’s Online Course Catalog. Each course entry details important course information including the results of a course review against the current iteration of the iNACOL National Standards for Quality Online Courses, Version 2. The iNACOL course standards provide a list of 52 standards divided among five sections: Content, Instructional Design, Student Assessment, Technology, and Course Evaluation and Support. State and local academic standards are also considered during reviews. In assessing the quality of national providers, it may be helpful to seek out results of reviews that other states have conducted against the same Quality Standards. Course completion and pass rates detail how many students successfully complete each course (based on the providers’ criteria of a successful completion). 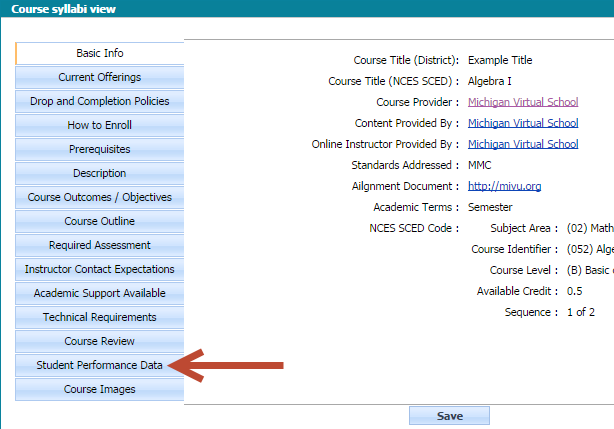 Pass rate data is publicly available for course titles in Michigan’s Statewide Catalog of Online Courses. Course providers should utilize a help desk with extensive hours and be able to readily answer any questions or resolve any issues that students, parents, or school personnel may encounter when enrolling or taking an online course. The availability and quality of help offered should be considered when choosing a provider. Online course design elements differ from traditional courses. Course design should offer more than one way to engage in and complete assignments, be more responsive to individual learner needs, provide opportunities for instructor-student and student-student communication, and include meaningful and timely feedback mechanisms. Elements and activities will vary from course to course and among providers. The table below shows the names of Michigan entities by entity type that on November 30, 2018, were offering fall courses statewide in the Micourses website. Schools offering virtual courses only to their own students are no longer required to submit their course syllabi to the Micourses website. The map below shows locations in Michigan that on November 30, 2018, were offering fall courses statewide in the Micourses website. The column chart below shows how the fall statewide course titles that were available on November 30, 2018, in the Micourses website varied by course content provider. The column chart below shows how the fall statewide course titles that were available on November 30, 2018, in the Micourses website varied by course instructor provider. The pie chart below shows the proportion of fall statewide course titles that were available on November 30, 2018, in the Micourses website by entity type (ISDs, LEAs, PSAs, Michigan Virtual). In order for a course syllabus to be included in the pie chart, it had to have at least one offering that was active within an active fall term and school year, and contain the complete course review results. For this pie chart, a course syllabus is only counted one time regardless of the number of times it was offered during the fall. The column chart below shows how the fall statewide course titles that were available on November 30, 2018, in the Micourses website varied by course content provider and entity type. The column chart below shows how the fall statewide course titles that were available on November 30, 2018, in the Micourses website varied by course instructor provider and entity type. The bar charts below show the proportion of fall statewide course titles that were available on November 30, 2018, in the Micourses website by subject area. In order for a course syllabus to be included in the charts, it had to have at least one offering that was active within an active fall term and school year, and contain the complete course review results. For these charts, a course syllabus is only counted one time regardless of the number of times it was offered during the fall. With the 2016-17 school year, districts choosing to provide 21f options to their own students, but not to students from other districts, were no longer required by the State School Aid Act to report their course syllabi information to the Michigan Virtual University via Michigan’s Online Course Catalog. For the fall semester, there were only five districts who leveraged the Micourses website to advertise their courses to their students; in the spring, this dropped to three districts. Thus, when communicating virtual options to their own students, districts are using channels other than the Micourses website. When it comes to offering virtual courses to students across districts, both the fall and the spring saw 12 different providers advertise their courses through the micourses.org website. These 12 consisted of one ISD, nine LEA districts, one PSA district and the Michigan Virtual School. Consistent with past years, we continue to see across both the fall and spring semesters the pattern that with the exception of the Michigan Virtual School, ISDs, LEAs and PSAs are predominantly getting content from some other third-party vendor. The Michigan Virtual School, in contrast, produces about 45% of its course titles in-house. There is greater variation when it comes to instructors. For the 2016-17 school year, ISDs continued to rely exclusively on third-party providers to supply the course instructor. LEA districts were assigning their own instructors to teach the virtual courses around 40% of the time and using the instructor provided by a third-party 60% of the time. PSA districts had too few offerings to comment on a pattern. Michigan Virtual used their own teachers to instruct their virtual courses 96% of the time; the exception was for their Chinese courses which are taught by instructors from Michigan State University’s Confucius Institute. Like the trend we have seen in Michigan’s K-12 Effectiveness Report series, the highest percentage of courses being offered statewide tend to fall into the course subject areas of Mathematics, Social Sciences and History, Life and Physical Sciences, and English Language and Literature. The one departure from the data observed in the Effectiveness Reports is that, for both the high school and middle school levels, the highest percentage of courses offered were in Foreign Language and Literature. Foreign Language courses represented around 17% of the high school offerings and 26% of the middle school offerings. To put those percentages into context, for the 2015-16 school year, only about 6% of the virtual enrollments reported to the state were for Foreign Language and Literature courses. Hence, it appears that providers of virtual courses are more optimistic about enrollments in that subject area than has come to fruition. Like the previous school year, districts choosing to provide 21f options to their own students, but not to students from other districts, were not required to report their course syllabi information to Michigan Virtual via Michigan’s Online Course Catalog. We no longer have districts using the catalog to communicate virtual options to their own students; districts are using channels other than the Micourses website for virtual options within a district. When it comes to offering virtual courses to students across districts, ISDs are no longer offering virtual courses through the statewide catalog. LEA districts continue to be the most active offerers of online courses. Thirteen different LEA districts had courses available to students statewide. Only one PSA offered courses, as did Michigan Virtual. Consistent with past years, LEAs are predominantly getting content from third-party vendors; about 95% of the courses offered by LEAs leveraged third-party content providers. The one PSA provider was the opposite, producing close to 90% of its course offerings in-house. Michigan Virtual, falls more in the middle with somewhere around half of its courses being produced in-house. The same trends apply when it comes to instructors. For the 2017-18 school year, LEA districts were assigning their own instructors to teach the virtual courses less than 20% of the time. This was half the percentage of the prior year. The one PSA district primarily used its own teachers. Michigan Virtual used their own teachers to instruct their virtual courses pretty much all of the time. Like the trend we have seen in Michigan’s K-12 Effectiveness Report 2016-17, the highest percentage of courses being offered statewide tend to fall into the course subject areas of Mathematics, Social Sciences and History, Life and Physical Sciences, and English Language and Literature. From a pricing perspective, we have continued to see reduction in variation. In the early years of the catalog, courses ranged from less than $50 to more than $600. With the 2017-18 school year, almost all virtual courses offered through the statewide catalog were priced between $300 and $400 dollars. This is quite a bit below the legislated ceiling of $509 for a course (6.67% of the State Minimum Foundation Allowance of $7,631 for the 2017-18 school year). Research supports that online learning is, on average, as effective if not more so than traditional classroom instruction. However, researchers are also quick to point out that it is not the medium (face-to-face vs. online) that matters as much as other factors like time on task, additional learning time, quality of instruction, etc. Just like in face-to-face settings, not all online experiences are high quality or even average. Those advising students interested in online learning should spend time looking at the performance data available on a provider prior to making enrollment decisions. Michigan Virtual Learning Research Institute is required to submit an annual report examining the effectiveness of online learning delivery models in preparing pupils to be college- and career-ready. The report highlights enrollment totals, completion rates, and the overall impact on students. The latest report reveals that about 7% of Michigan K-12 students took at least one virtually delivered course in the 2016-17 school year. There was variability in school-wide pass rates; 55% of schools that had virtual enrollments in 2016-17 had school-wide virtual pass rates of 70% or better. Clearly, some schools are implementing models that appear to be working, but too many do not. Lastly, students taking virtual courses in a supplemental capacity appear to be more successful when they take only a few virtual enrollments a year. For more information about this report, including more key findings, please visit the Research Trends section of this resource. Like other Michigan public schools, performance data for cyber schools is available through the MI School Data website. Performance data includes sections on student outcomes, culture of learning, value for money, salary data, and the Michigan Public School Accountability Scorecard rating. The table below provides key information for the cyber schools that were open in Michigan as of November 30, 2018. There are now 60 LEA schools across the state that offer full-time virtual learning options to district students. A full list of these schools can be found be searching CEPI’s website at CEPI Detailed Search by setting the search filters as below. Parent Dashboard for School Transparency for each of these schools may be found by on the MI School Data website. The Michigan Virtual School is run by Michigan Virtual, a nonprofit organization. Michigan Virtual is required to provide an annual legislative report detailing, among other things, registration and completion rates by course and the overall completion rate percentage. Its Annual Reports are available for free on the Michigan Virtual website. The Micourses website includes performance data from the preceding school year(s). This includes information on the number of enrollments from the prior year and the number of those enrollments that earned 60% or more of the total course points. The site also displays a completion rate for that year. Courses with no data from a previous year suggest the course was not offered during that year. To view the performance data for a course title, click on the “Student Performance Data” link on a syllabus. There is also a notes field that may have additional information about the performance data. For additional resources on how to use the Micourses website, see the Public Help Resources. Just like face-to-face schools, online providers have many of the same expenses, albeit likely in different proportions. For instance, in their paper, The Costs of Online Learning, Battaglino, Halderman, and Laurans (2010) categorize these costs into five different categories: Labor (teachers and administrators), Content Acquisition, Technology and Infrastructure, School Operations, and Student Support. The chart below illustrates the primary sources of or influences on expenditures within these categories. The three different delivery models – fully online cyber schools, supplemental courses, and blended programs – have different cost structures because the demands of their design and operation vary. The impact on costs from common features such as course content, technology, and instructors vary as well. The cost of an online course is tied to the direct expenses associated with developing it or paying for it through enrollment/tuition fees, including required course materials such as learning kits or textbooks. Other types of associated expenses include indirect costs such as facilities, computers, network connections, and local mentor support services. State law (Section 21f of the State School Aid Act) requires that a student enrolled in an online course must be provided the same rights and access to technology as all other pupils enrolled in his or her educating district’s school. A review of online course offerings available to Michigan students today indicates that over 90% of online courses cost between $300 and $400 for a single semester course. Students in classrooms employing blended learning use the technology available in the school and may use devices at home as well. The cost of blended learning will vary depending on whether the teacher is creating course material or the school district purchases it from a provider. Cyber schools usually provide devices or Internet access. Their technology infrastructure will vary from that of a traditional school. On the other hand, cyber schools do not have the same expenses as traditional brick and mortar schools. Traditional schools – including those that offer blended learning – have to provide classrooms, food service, special education services, and transportation, for example. The expense associated with instructors varies: some supplemental courses do not require an instructor; others do not include an instructor so the district must supply one. Cyber schools and blended programs will have staff expenses that supplemental instruction does not. Another important factor in determining instructional costs relates to the student-to-teacher ratio. The pie chart below shows how the fall statewide course titles that were available on November 30, 2018, in the Micourses website varied by course fee. In order for a course syllabus to be included in the pie chart, it had to have at least one offering that was active within an active fall term and school year, and contain the complete course review results. For this pie chart, a course syllabus is only counted one time regardless of the number of times it was offered during the fall. Research in K-12 online and blended learning continues to grow and help us understand what works and what needs improvement in various areas of the field, including design, instruction, developing new learning environments, meeting social and emotional needs of students, training educators, and more. Multiple resources are available to help keep up with the trends. The Research Clearinghouse for K-12 Blended & Online Learning is available thanks to a collaboration between the International Association for K-12 Online Learning (iNACOL) and Michigan Virtual. The Clearinghouse is a regularly-updated repository of references to research articles and other publications from the field of K-12 online and blended learning, many of which are freely accessible on the Internet. Keeping Pace reports, formally called Keeping Pace with K-12 Online & Blended Learning: An Annual Review of Policy and Research, are released annually by the Evergreen Education Group. These reports analyze state policy and online learning legislation, state-by-state enrollment data, online and blended planning and implementation guides, as well as national trends in online learning. MVLRI is another source of information regarding research in K-12 online and blended learning. In 2012, the Governor and Michigan Legislature asked Michigan Virtual to establish a center for online learning research and innovation to work on a variety of projects. MVLRI is dedicated to furthering the field of K-12 online education through innovative, practically-focused, high-quality research. MVLRI hosts free webinars and podcasts where researchers highlight the latest research in the field. MVLRI also produces a Research Blog where the latest research and research-related opportunities from around the world are shared. The open-access Handbook of Research in K-12 Online and Blended Learning (Second Edition) also helps lay the groundwork for future studies. This handbook provides both introductory chapters to the field of K-12 online and blended learning and also delves into specific spaces, including research on learning, K-12 learning in content domains, teaching, the role of the “other” (mentors, parents, support staff, etc), and technology innovations. This handbook is a key resource in the historical, current, and future perspectives on research in K-12 online and blended learning. Despite the growing literature, many areas still need to be explored more deeply. In 2013, iNACOL published its Research Agenda to guide the research community’s efforts from 2013-2018, and specifically recognized 10 priorities specific to future research needs in K-12 online and blended learning. Explore the effect of policy (national, state, and local) on quality assurance. Though the opportunities presented by online and blended learning are readily apparent, more research must be done to ensure these opportunities translate to high-quality educational experiences for students. MVLRI prepares an annual report that highlights enrollment totals, completion rates, and the overall impact of virtual courses on Michigan K-12 pupils. Report findings are based on data reported to the state by schools. Self-reported data is not optimal but represents the best data that is collected to date. Data for these three types included both their virtual coursework and their non-virtual coursework. 593 school districts (two-thirds of districts) reported at least one virtual enrollment. 56% of the 1,102 schools with virtual enrollments had 100 or more virtual enrollments. 87% of schools with virtual learning were Local Education Agency (LEA) schools. LEAs accounted for 58% of the virtual enrollments; Public School Academies (PSA) generated 41% of the virtual enrollments. 67% of virtual enrollments occurred in the core subject areas of English Language & Literature, Mathematics, Life & Physical Sciences, and Social Sciences and History. The virtual pass rates for each core subject were English Language and Literature (52%), Mathematics (49%), Life & Physical Sciences (53%), and Social Sciences and History (56%). Online courses (defined as including a teacher in the virtual environment) produced 80% of the virtual enrollments. Digital learning (without a teacher in the virtual environment) and blended learning (some virtual, some face-to-face instruction) each accounted for about 10% of the virtual enrollments. Almost half of the virtual learners passed all their virtual courses. About one-quarter of virtual learners did not pass any of their virtual courses. Of the 25,023 students who did not pass any of their virtual courses, 46% only took one or two courses. Almost 9,500 students took and did not pass five or more virtual courses with more than 2,700 students taking and not passing 11 or more virtual courses. Students enrolled in Michigan Virtual courses were stronger students in general as measured by a higher pass rate in their non-virtual courses (92%) compared to students who were enrolled in their local school’s virtual solution (75% pass rate). However, students in Michigan Virtual School courses were also more successful in their virtual courses, even when considering their non-virtual performance. Students in poverty (54%) continue to make up a disproportionate number of virtual learners. Students in poverty also had a lower pass rate (48%) than did students who were not in poverty (66%). About half of 11th-grade virtual learners who took SAT were proficient on the Reading/Writing component. About a quarter tested proficient in Science or in Math. The report findings aid educational leaders and researchers in understanding and designing subsequent studies to find out under what conditions virtual learning can and is working and leverage that understanding to cultivate virtual programs that yield the best results. Online learning provides new opportunities for individualization and personalization of learning, flexible scheduling and location, access to highly qualified and specialized instructors, credit recovery, advanced placement, and on-demand learning. Whatever the reason for pursuing an online experience – whether it’s one course or a fully online program – students benefit academically from access to course content when they want it and individualized pacing and flexible scheduling matched to their current knowledge and skill. On-demand access to course content also means that parents can monitor their students’ learning and provide focused motivation and support for struggling students. Schools also benefit from increased availability of and access to online learning because they can offer more options to meet the needs of their students without hiring additional staff, often a difficult task in subject areas with a shortage of highly qualified teachers. The transition of learning environments from traditional classroom models to any time, any place, any pace learning systems will require the transformation of both individual and organizational behavior. Michigan Virtual stands ready and looks forward to supporting educational partners in accommodating these changes and working with the state’s policy leaders and elected officials to further develop Michigan’s online learning industry and to help position the state to assume a national leadership role in the knowledge economy. Michigan Virtual developed this planning document as a practical resource to assist school board members, administrators, teachers, parents and others in meeting student needs. The document presents an overview of online and blended learning, offers guiding questions to support local planning efforts, identifies standards for teaching in online and blended environments, and provides student and district planning rubrics. With the enactment of Section 21f of the State School Aid Act of 2013 came many questions for parents, schools, and students. Michigan Virtual collaborated with key stakeholders including the Michigan Department of Education and several professional organizations working in Michigan education to produce the 21f Toolkit. The Toolkit is a collection of practical resources including sample letters, forms, and draft policies, and reference material including slide presentations and a detailed implementation guide. Additional resources are being added as they are created and revised based upon legislative revisions. This guide is intended to provide an understanding of the fundamental elements of mentoring or coaching students for success with online courses and has been prepared with the assistance and insight of experienced mentors. The guide describes the roles and responsibilities of the mentor and contains tools to prepare mentors for working with online learners. OLOT is a freely available self-paced learning tool designed to help students understand what online learning entails and introduce the skills and knowledge that are key to success. Used in conjunction with the Online Learner Readiness Rubric, OLOT can help students better understand what to expect when participating in an online course and their level of preparedness. Content is divided into four modules and covers a broad array of topics, including the nature of the online coursework, the technical skills needed for online course participation, the influence of learning skills, interest, and motivation on online course performance, and basic organization and workflow tips for students. This module is a collection of information, media assets, and assessments highlighting the best practices for mentoring online learners, specifically 6-12 students. Information in this module is drawn from research by Dr. Jered Borup of George Mason University, an MVLRI Fellow, as well as personal interviews with mentors working in schools across the state of Michigan. Special thanks also goes to the staff of the online learning program at Three Rivers High School in Three Rivers, MI for sharing their experience and effective mentoring practices in the videos contained in this module. Their expertise and that of mentors at nine other schools helped inform the content of the module and the growing body of work aimed at improving online learning experiences for students in Michigan. This website, created and maintained by iNACOL, was developed as a public resource to meet a growing need for information on starting online education programs. The website is intended for individuals interested in investigating the possibility of creating an online learning program and contains information for policymakers such as state legislators, staff members at the state department of education, and district administrators who wish to establish a positive policy environment for online learning. This practical guide was written for Michigan parents, guardians, counselors, and others who want to help students decide whether online learning is a good option for them. It includes discussion about online learning opportunities, characteristics of a successful online learner, and how to prepare for learning online. The Guide examines how online learning supports next-generation learning models, poses practical planning questions, provides a preparation checklist, offers advice for parents, and includes an online learner readiness rubric. Michigan’s Online Course Catalog contains syllabi for online courses being offered by Michigan school districts as well as Michigan Virtual. All courses contained in the catalog include quality review ratings using nationally-recognized standards. 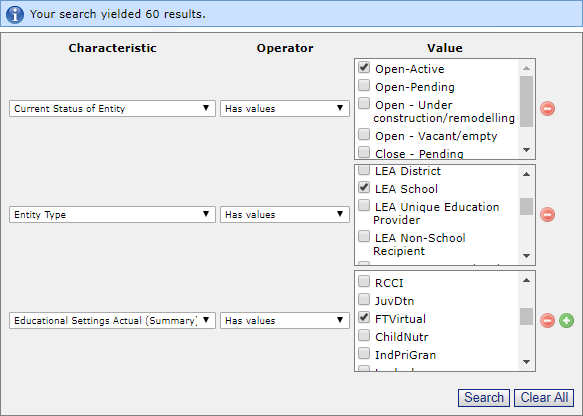 Individuals browsing a district or the statewide catalog in the website have the ability to view course fees and additional costs when viewing course information, as well as the ability to search the entire catalog by course price. This report envisions the effects of technology in shaping K-12 education in Michigan. The report presents recommendations specific to students, teachers, schools, technology, data, and quality and accountability regarding personalized learning. The overall recommendation of the report, based on feedback from stakeholders and state and national educational leaders, is for parents and educators to focus on personalized learning for all students. This report, published by the International Association for K-12 Online Learning as part of the Promising Practices in Online Learning series, is intended to assist parents in understanding what online learning is and how to select the right online school, program, or course.